Seriously, how can you NOT love eggs? They're a quick, nutritious, not to mention delicious meal you can enjoy at anytime of the day and can be cooked practically any way (yeah, we really like them). However, of all the egg varieties nothing beats scrambled eggs. Just in case you’re not convinced, here’s 17 pimped out scrambled egg recipes you have to try. Jazz up your scrambled eggs with curly kale and ham. To perfect this recipe, make sure the eggs are cooked on low heat to allow the eggs to be soft and slightly creamy. This recipe is easy and delicious, serve with your fave side of veggies and you are good to go. Creamy, tangy, soft crumbly goats cheese in scrambled eggs. YES PLEASE! The mix of caramelised onions, peppers, spices and a little chilli makes this scrambled egg recipe one of our absolute favourites. Pair with the avocado and radish salad for a nutritious and very colourful meal. We know what you're thinking, orange juice in your eggs sounds pretty weird. But trust us it really works. A small dash of orange juice adds a touch of sweetness, it’s a subtle taste that adds something new to the recipe. This recipe is packed full of favour and makes for the perfect Saturday morning breakfast. Stir in your favourite sautéed vegetables and enjoy this fast, easy meal. Top with grated cheese for the perfect finishing touch. Cheesy eggs mixed with mushrooms, tomatoes and sausages. This is a delicious meal on its on, or pop it into a burrito. Anything with a bit of spice gets the go ahead from us and these Indian eggs - known as eggs bhurji - are no exception. 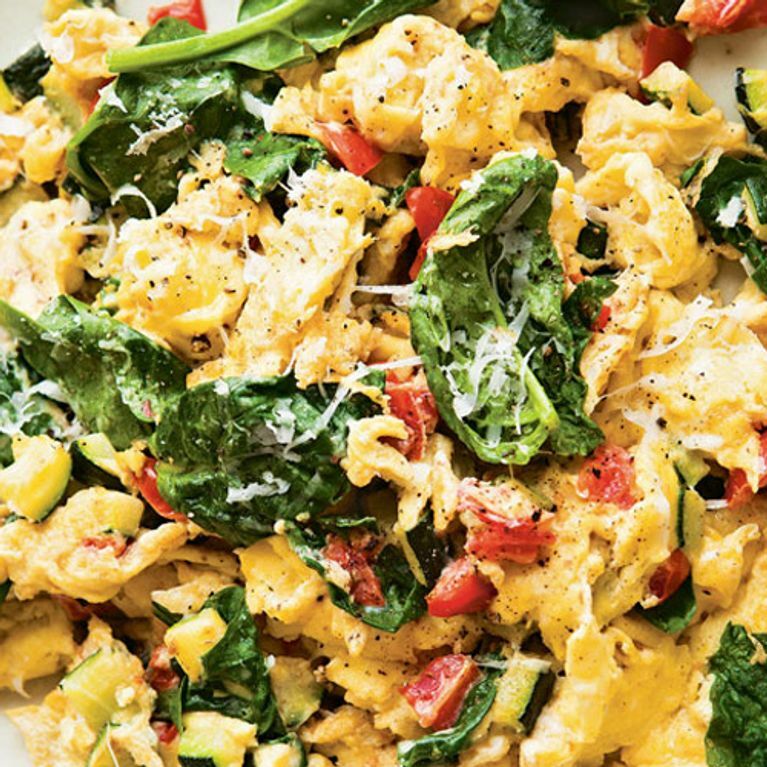 Pimp up your scrambled eggs by adding tumeric, chia, spinach and pesto. This is basically the healthiest eggs are ever gonna get. A fail-proof recipe that works every time. Yes it's a little indulgent, but it’s a treat worth having. Add a kick to your scrambled eggs with a little sea salt and ground black pepper and a dollop of chilli jam. Breakfast fit for a queen. The perfect breakfast for a Sunday morning, the smoked trout and horseradish work so well together. Enjoy the eggs on a bagel and a pot of coffee. Tender soft scrambled eggs with mushrooms and plenty of parsley and garlic. Enough said. Trust us, it tastes just as good as it looks.